A couple of guys were sitting in the Hillsboro Pizza Hut last week wearing crop insurance adjuster ballcaps. Since the hats made it obvious who they were, they were asked the question they said they?re being asked everywhere, ?What?s happening with the wheat?? Ask any Kansas farmer and the answer will be the same. Crop insurance is one of the more complicated risk-management issues with which the Kansas farmer needs to deal. Farmers planning to earn and receive farm program payments and benefits from the U.S. Department of Agriculture are required by existing farm-bill regulations to file acreage reports for all cropland on their enrolled farms. Ty Goossen of Hillsboro shows the angus heifer that won grand champion for the breeding heifers in the annual Spring Beef Show April 28 at the Marion County Fairgrounds in Hillsboro. Don Ratzlaff / Free Press Click image to enlarge. Sixty-six 4-Hers from Marion County and beyond competed April 28 in the annual Spring Beef Show at the Marion County Fairgrounds in Hillsboro. The show is an indicator of the growth rate and condition of animals intended for show in upcoming county fairs, according to Rickey Roberts, Marion County extension agent who coordinated the event. Congressman Jerry Moran visited wheat fields in four Kansas counties April 30 to get a first-hand look at the damage caused by the Easter weekend freeze. Moran said he wanted to ?see and get a feel for what farmers are facing.? Also on the tour were Rebecca Davis, director of the Risk Management Agency?s Topeka regional office, Jim Shroyer, extension agronomist at Kansas State University, and representatives of the Kansas Association of Wheat Growers. ?The freeze stopped the main tillers in their tracks,? Shroyer said. 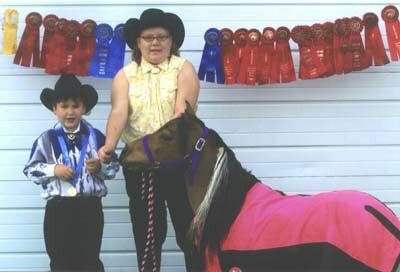 Larry Zieammerman and sister Cara Martin with one of their miniature horses. Siblings Cara Martin, 12, and Larry Zieammerman, 6, received several ribbons at the Heartland Miniature Horse Classic held April 28 and 29 at the Kansas Coliseum in Wichita. Gary Kilgore (foreground), KSU crops and soils specialist, offers his view of the wheat situation in Marion County during Tuesday?s gathering at the test plots southeast of Hillsboro. Click thumbnail to enlarge. Local wheat producers hoping to receive clear direction about what to do with their freeze-bitten wheat fields were probably disappointed following two separate gatherings with crop experts. The bottom line at both gathering was essentially the same: Be patient. It?s too early to know if the damage caused by the Easter-season freeze is devastating or merely discouraging.